Our product range includes a wide range of vermaculite coated fiber cloth fabric blanket, vermaculite coated ceramic blankets and coated ceramic cloth. We are one of the most leading manufacturers of ASTM Approved Fire blanket in India.Fire Blanket is a highly flame-resistant blanket that can be used to either extinguish a small fire or to wrap around a person. In order for a fire to burn, all three elements of the fire angle must be present: heat, fuel and oxygen. A fire blanket either completely surrounds a burning object or is placed over a burning object and sealed closely to a solid surface around the fire. Whether the blanket is placed on top, or surrounding it, the job of the blanket is to cut off the oxygen supply to the fire, thereby putting it out. ideal for normal welding cutting,few spatter protection.it is maximum used in the market industry. used on some what heavytype of work ranging temp for 1200c. 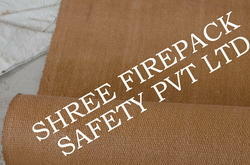 Ø Fire blanket can be tailor made in linear meter as required. Ø Fire Blankets are provided with border linings with eyelets at mtr or as stated with hooks at edges. We are one of the most leading manufacturers of ASTM Approved welding blanket in India. We deal in the non asbestos welding blanket known for high temperature and heat resistance. The temperature resistance of these welding blankets is up to 550 D.C to 1100 D.C.
Welding Blankets are manufactured with ‘E’ fiber glass & ceramic fiber glass with different coating like graphite, Mica, silicon & PTFE. Based on such high quality raw material, these welding blankets display optimum life and endurance. In addition to this, the offered range is available in 0.6 mm to 3mm desired thickness and is made stiched using kevlar thread. Available with loops & eyelets, this range is best suited for protecting the machines where heavy welding is done. These products are available in sizes such as 1 m x 2 m, 2 m X 2 m and can be customized as per client requirement of clients. Owing to the vast industry experience, we are engaged in offering Vermaculite Coated Ceramic Blankets to the customers. We are offering an exquisite range of Coated Ceramic Cloth. This range is best suited for protecting the machines where heavy welding is done. Available in sizes such as 1 m x 2 m, 2 m X 2 m ,1mx3m or as desired.